Hey everyone... Zev0 and I have decided to do a render contest! 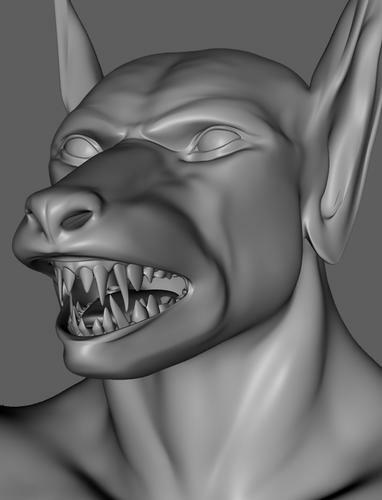 I'm interested in your product, as it looks like it would do much of what I need :) For now I've had to use the basic controls to try and emulate the teeth I need, but it's very limited. Also, can your product jut out the lower jaw so those sharp tusks can be seen outside of a closed mouth? This one I managed to replicate with overriding some basic controls in Genesis, but certain poses will reset those values, so I have to re-tweak it again. How far can you push the lower jaw out? The jaw can be pushed out as much as you want, but it will go through the lips. It all depends on the facial morph you have dialled. 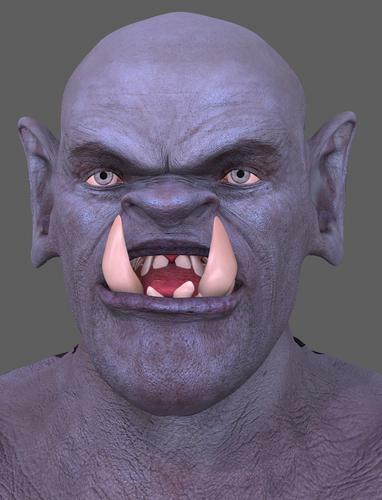 In terms of the teeth morphs you can do the requested morphs, however I'm not sure about tusks. Maybe post me an example so I can try to duplicate and tell you what limitations I run into:) I know for one you cannot have any teeth oustide the mouth, as I did not include any face forward morphs. Those are extremely hard to do and to get working with the rest of the morphs in this set. If you want tusks, you can have a look at this product by Sickleyield http://www.renderosity.com/mod/bcs/index.php?ViewProduct=91791 and maybe combine it with this set. I'm really impressed with Dental Plan... it was a good idea for a product to begin with, but the final execution is just fantastic. Those age morphs just flew to the top of my "stuff to get when not broke" list. Thanks for getting back to me. For the Jaw, it's what I figured, and that's all good. Here is an example of 'tusks'. Basically, just large fangs but jutting from the lower jaw instead of the upper jaw. With current genesis morphs, that's as large as I can make them (any larger and they deform badly). I would like to make them a bit larger, and that is what I was wondering with your product. 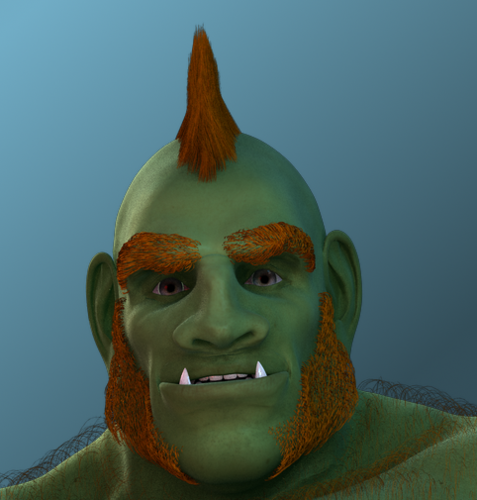 Here is a super quick render, hence why it looks like crap lol. With turning off limits on certain morphs, I was able to get it up to this size. Although it wasn't designed for tusks, you can kinda get those results. You have to increase the lower jaw X scale as well. I just noticed this thread for the first time. Interesting. Does it allow for various animal-type teeth? I have a bunch of animal heads — Anubis, the Creature Creator stuff, etc., but many of these morphs only change the face, e.g. into a muzzle. Open the mouth and I don't see realistic cat- or dog-type fangs. How well can Dental Plan do this? Don't know about realistic, but you can get results like this. Cool. When I have some free time I will try and incorporate some more morphs and just release them as a freebie. There were some I struggled with and just could not get done in time for its release. Useful for monsters and big nasty critters, but I was thinking of e.g. what a lion tamer would see — like in this Google Images search. Hi , I just bought this and I can't find the morphs in poser. 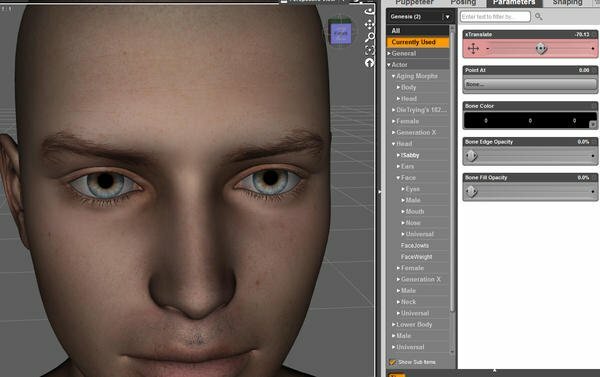 "Note that the morphs will work in Poser on a Genesis figure loaded through the DSON Importer for Poser, however the script to automatically apply effects, as well as the materials will not." I tried reloading my Genesis figure , but the morphs are nowhere to be found. This doesn't seem to work with the Genesis Teen's either (Justin) (for Poser). The textures when compared have a different layout (which is stated in the product description) that the materials/textures wont work , but the morphs should had been working and they are not. As far as I know the morphs work in Poser. Where did you install them? And all the files are there , but there is no "X:\Runtime\Libraries\Pose\???????" in the files installed. To get the morphs to work all you do is copy the data folder from the product and overwrite the data folder where your Poser Genesis content is installed. Easiest thing to do is extract the product files to your desktop, choose the data folder and overwrite the data where ever your Genesis\Daz data folder is located. Thats how it works for DAZ , for Poser the files morphs need to be installed in X:\Runtime\Libraries\Pose\??????? and it is not included in the installation package. Isn't the above that you mentioned what the installation package already does? No. Morph files for Daz and Poser are installed in the data folder. The ones for Daz works for Poser. Anything else is material based. All you want is the morphs, so all you do is copy the data folder. The morphs will then appear under the teeth group. Draagonstorm and Daz handled the install files. All I know is that to get the morphs to work in Poser, only the Data folder contents is required. That is how all my previous products work and this is no different. But if there was a change, please PM draagonstorm, but I am sure just by copying the data folder it will work:) Let me know how it goes. The files are already there. I overwritten. Restarted Poser , loaded the files again. Sorry I mean't mouth. To test I just did this and it works fine. I am out of solutions:( Maybe PM Draagonstorm. OK , I got'them to work. The problem was that they do not appear on current characters and they appear on the new imported characters only under the Mouth group. Cool!!!!! Glad they work:) Have fun:) Yes any new morphs only populate once a new Genesis is loaded after Poser is closed. It's the same as Daz. I think I found some sort of glitch occurring with dental plan/Ageing for Genesis. I've noticed it has a strange affect on the Iris, of all things. It seems to alter it's depth on the eyes. All of the controls seem to have an affect on it to some extent, when you have multiple morphs active it's much more noticeable . I checked every morph I had dialed on a character, then worked out My problem with the eyes was the most unlikely morphs of dental plan. I also discovered, the same issue with Ageing morphs. I dont know why it's doing it, or what caused it to do that. Grab Genesis, apply a texture... Dial a bunch of Dental Plan morphs and watch the irises. 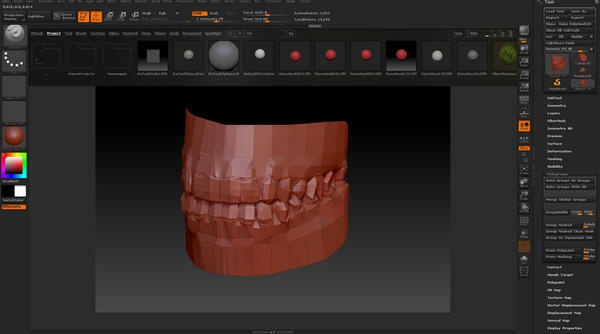 I attached a Screen shot of genesis with a bunch of dental morphs dialed at 100% No other morphs are dialed. It's either just some malfunction with my computer, or it's indeed widespread. I only noticed this when I was playing with close ups and checking my eye surfacing settings. Edit: Added Screen shot without morphs applied. Hmmm..this is strange. It's happening here as well. When I made the morphs I had hidden the rest of Genesis in Zbrush and only had the mouth visible, therefor working with the assurance that nothing else will be affected. Have no idea why this is affecting the eyes of all places. The only solution I can think of is that I create some type of IRIS reset morph. Thanks for Bringing this to my attention. I am just confused as to why this happened. Yeah I know, It totally had me baffled. From what I hear from the many PA's they do it the same way. Very odd. And it was the last morph set I expected it to be. I discovered it was also Ageing morphs as well, when I loaded an aged character to compare to. Initially I thought It was a texture issue in my custom eye textures, then I realized it was some anomaly with a morph. Took me like an hour to work out it was The teeth and aging packs. I also tried it with evolution morphs to see if it did it too, but It didn't have that anomaly. Perhaps a fix/correctional morph slider for the iris that can be dialed to a value that suits how strong the animally is* (Determined by the user?) would be good addition to update these items. 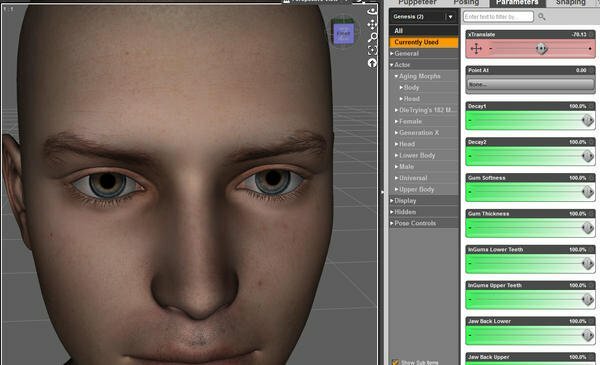 *Depending on morph values in Aging and Dental, and how many morphs are active will determine how strong the iris needs to be corrected, so each different character would require unique values (in theory). I wonder if any other vendors have came across this in their work?